BHUBANESWAR: After screening of Odia film ‘Aadim Vichar’ (The Ancient Justice) at the Indian Panorama Category of International Film Festival of India (IFFI-2014) on Tuesday, audience and journalists asked Atal Bihari Panda, protagonist of the film, about his age. Panda, who is attending the IFFI for the second time in a row, gleefully replied, “It is just a number”. The 84-year-old actor, who portrayed the role of ‘Kondh Budha’ (an elderly man of Kondh tribal community) in the film, was appreciated by one and all at the biggest film festival that celebrates Indian cinema. ‘Aadim Vichar’, directed by Sabyasachi Mohapatra, is the octogenarian actor’s second film, the first being ‘Sala Budha’ (The Stupid Oldman) that got the Best State Film Award – Mohan Sundar Dev Goswami Award – for 2013. Even at this age, Panda’s exuberance was visible at last week’s State Film Awards where Panda danced on a Sambalpuri folk song to a houseful audience at the Utkal Mandap. He also bagged the Best Actor Award for playing the role of ‘Sala Budha’. “I do not let my age shadow my acting skills,” says the Sonepur-based actor. ‘Aadim Vichar’ is a sequel to Mohapatra’s ‘Sala Budha’, a Sambalpuri movie, that dealt with the plight of elderly people in villages of Western Odisha. ‘Aadim Vichar’ portrays the societal structure of Kondh community in Kandhamal. After IFFI, the film will be screened at three more national level film fests. Panda who was a stage actor and script writer by profession, had never thought of acting in any Odia films. “I got into Sala Budha by chance. Sabyasachi Mohapatra during his youth had done a small role in one of my plays ‘Phata Mardala’, where I played the lead character. Besides, his father Kapileswar Mohapatra and I were classmates. Two years back, Sabyasachi approached me with an idea of converting some of the short stories that Kapileswar authored into a film script,” he recalls. Although the script was ready, Sabyasachi could not find any senior actor in Ollywood to play the lead role of ‘Sala Budha’. “After nearly three months, he came to me again and urged me to be the protagonist of the film. Though I was reluctant initially because of my age and lack of experience in films, Sabyasachi convinced me. I was 82 when shooting for the film started, but today I am extremely thankful to my director for giving me this opportunity. He has taught me how to face the camera,” he says. Prior to ‘Sala Budha’, he had done a 45-minute tele-film ‘Dangar Tale Dambaru Baba’ on tribal communities in Odisha for Doordarshan. ‘Aadim Vichar’, Panda says, is the most difficult role he has played so far. He has written the script, based on Kapileswar’s stories, for this film as well. “Aadim Vichar is a longer film compared to Sala Budha and was shot in the hilly terrains of Kandhamal during winter. Since, it is a much more intense movie compared to ‘Sala Budha’, a lot of research and practice went into it,” says Panda, who has acted in over 100 plays apart from writing 63 dramas and six operas, both in Odia and Koshali language. Both Sabyasachi and Panda are making three more films based on the tribal culture of Odisha and they would begin shooting for their third venture next year. Given a choice, Panda says, he would chose art films over commercial cinema any day. “I want to die a death like Balai Banerjee did. 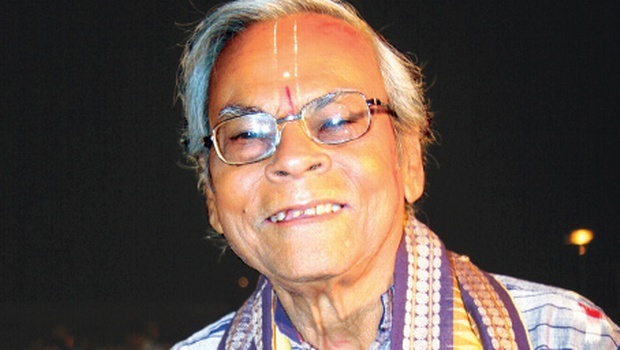 A popular stage actor of Janata Rangamanch of Cuttack, he died while acting on the stage. I too want to breathe my last on the stage,” Panda smiles.